Bontress Hair Serum (Capixyl/Anagain/Hexaplant Richter) is a hairloss treatment. It helps to thicken hair and prevent further hairloss by moisturizing your hair. 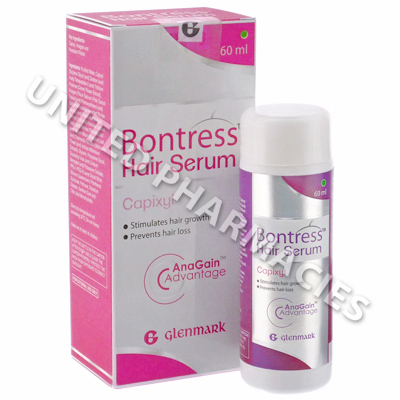 Bontress Hair Serum (Capixyl/Anagain/Hexaplant Richter) should be applied to dry hair. 10 pumps (around 2mL) of serum should be massaged thoroughly through the hair and into the scalp. The serum should not be washed or rinsed out - it should be left to dry in the hair. Bontress Hair Serum (Capixyl/Anagain/Hexaplant Richter) might cause mild irritation or itching. Other side effects are also possible. Ensure that you report all reactions to your doctor. If you notice any serious side effects, ensure that you get medical assistance straight away. Bontress Hair Serum (Capixyl/Anagain/Hexaplant Richter) is only to be used topically, and must never be ingested. It should not be applied to sensitive areas of the body. If this treatment proves ineffective for your condition, an alternative may be recommended by your physician. Always use Bontress Hair Serum as you have been prescribed by your doctor. Never self-medicate or change your dosage without first consulting your doctor. The correct dosage can vary depending on your health, medical history, and the severity of the condition being treated.